ELKHART LAKE, Wis. (June 20, 2010) – Chris Bovis, Joel Lipperini and Mike Moser highlighted a weekend of outstanding performances by Honda and Acura drivers at the SCCA WeatherTech June Sprints, winning their respective classes in the 55th running of the classic sports-car racing event at Road America. 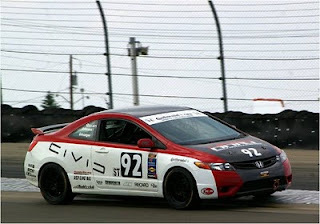 Nineteen Honda and Acura racers, running in seven classes, were part of the 350-strong June Sprints field, including the first three Honda Fit-powered Formula F racers to compete at the summer classic. Bovis, the 2007 SCCA National Champion in GT Lite, led teammates Jim Dentici and Bob Clark across the finish line in a 1-2-3 result for their JDM/Ragland Racing Honda CRXs. Pole qualifier Dentici and the third-starting Clark both slid off course in wet conditions during the opening lap of the race, then made impressive recoveries to finish second and third, respectively. 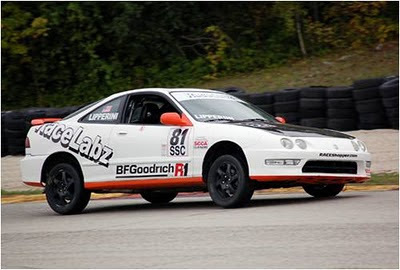 Lipperini, the defending National Champion in Showroom Stock C, c ontinued his winning ways at Road America with a flag-to-flag victory in his RaceLabz Acura Integra. Moser won the H Production race, driving the same Core Consulting Honda CRX taken to the SCCA national title by Dan Meller last September. Moser is undefeated in five races this season, and a leading contender for the H Production national championship in September. 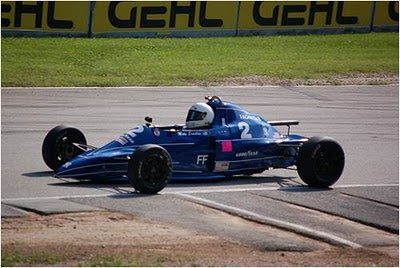 In Formula F, Mike Scanlan made the long tow from Great Neck, New York to finish 10th in the highly-competitive 22-car field, driving his Swift DB-6 Honda. Other Honda-powered Formula F racers at this year’s Sprints included Chicago’s Tim Wise, driving his Repliform Swift DB-6; and Dan Layton, driving a Van Diemen RF98/00 for Quantum Racing Services out of Oklahoma City. Kristopher “Kip” Olson made a big splash with the debut of his Driving Ambition Acura NSX in the Super Touring-Over class, qualifying on the pole, setting a new lap record and leading eight laps en route to a second-place finish in the opening race of the weekend. Kevin Ruck also led several laps in F Production with his Engineered Performance Acura Integra, before finishing second. Other Honda and Acura finishes of note include John Costello, third in Touring 3 in his Honda S2000; and Greg Gauper, who finished third in H Production in his Honda CRX. Celebrating its 55th consecutive year at the four-mile Road America circuit in Elkhart Lake, Wis., the WeatherTech June Sprints is the largest annual SafeRacer SCCA National Racing Series event, offering racers from across the country the opportunity to compete on one of the country’s premier racing layouts and continue in their efforts to qualify for the SCCA National Championship Runoffs, conducted at Road America in mid-September. 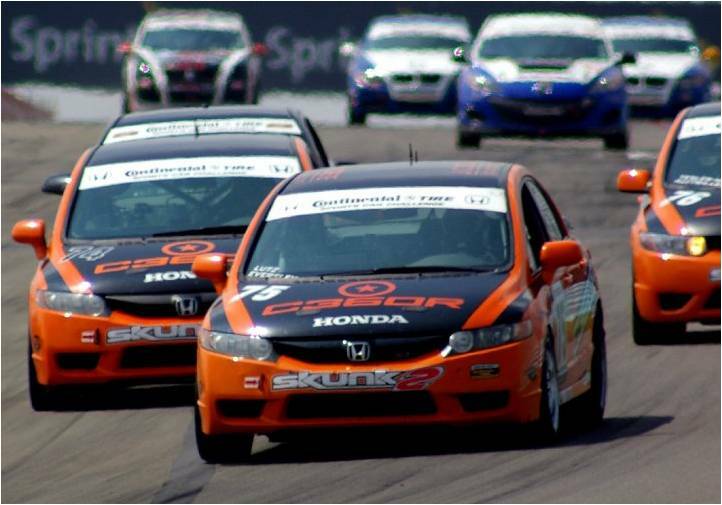 Through its Honda Racing Line program, Honda Racing/HPD provides support and incentive programs to Honda and Acura racers competing at the SCCA Runoffs and in other forms of grassroots motorsports competition. Additional details on the Honda Racing Line can be found at http://racing.honda.com/hpd. 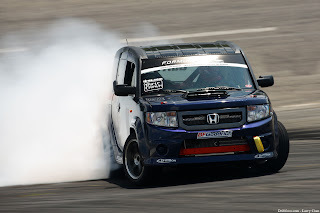 Honda Performance Development (HPD) is the Honda racing company within North America. Founded in 1993 and located in Santa Clarita, Calif., HPD is the technical operations center for Honda and Acura high-performance racing cars and engines. In addition to its Grassroots Motorsports Initiative, HPD is the single engine supplier to the IndyCar Series and competes in prototype sports-car racing in the American Le Mans Series and in Europe. Photo 2: Mike Scanlan led three Honda Fit-powered Formula Fs at the June Sprints, finishing 10th. 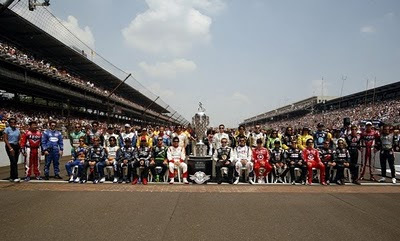 It isn’t always the case (see Kanaan, Tony, in 2004, ’06, ’07, etc) but this year, at least, the fastest car and bravest driver won the Indianapolis 500. 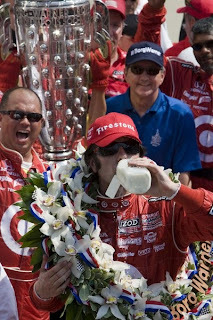 For, just as teammate Scott Dixon had done at Kansas to start the month of May, Dario Franchitti gave the Indy field an old-fashioned whuppin’ to win his second “500”. Yeah, he got a break at the end with the yellow for the Conway/Hunter-Reay crash, but the #10 Target car was the fastest thing on the track all day long, running in ultra-trimmed out form, and Dario was willing, and more than able, to hang on for the ride. Prior to Race Day, however, the smart money was on Team Penske. And, more specifically, Helio Castroneves. Helio l-o-o-o-o-o-oves the Speedway, and the grand ol’ dame appears to frequently return the favor. But not this year. Helio dominated Pole Day, throwing down a four-lap run in the new “Fast Nine” shootout that visibly deflated his competition – just as he had intended. Teammates Ryan Briscoe and Will Power weren’t far behind. The race appeared to be Penske’s to lose. And lose it they did. It all started with the weather. After a cool – and sometimes wet – week of practice, conditions warmed up for qualifying. Penske adjusted accordingly, claimed the first two qualifying spots and came within a gnat’s eyelash of locking up the full front row. But on race day, it went clear past warm into HOT territory: 95 or so degrees ambient, and more than 130 degrees on the asphalt. To compensate for the hotter (and greasier) conditions, all three Penske cars cranked in a bit more downforce on Race Day – as did Ganassi on Dixon’s car. But the Franchitti side of the Ganassi garage elected to run trimmed-out. In the early laps, Dario had to hang on to a sliding car. But it also was a fast car, and as the track continued to “rubber in” during the first half of the race, the #10 car just got quicker and quicker. 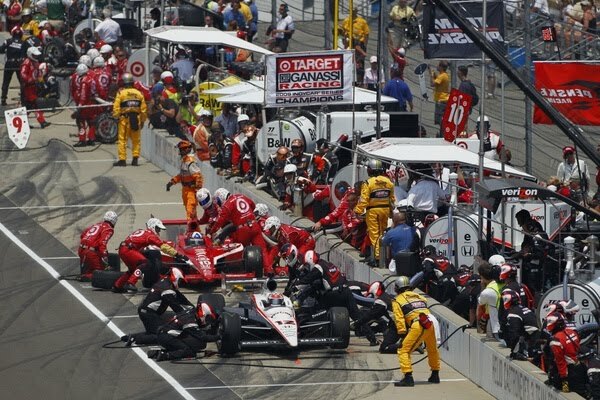 Now, the trick for Chip Ganassi, [engineer] Chris Simmons & Co. in Dario’s pit was to make the right pit calls. With a low-downforce setup, Dario did NOT want to get stuck behind a lot of traffic. He needed to stay out front as much as possible, and the Pit Lane strategy team did that for him. Ultimately, whatever chances the Penske trio and Dixon may have had disappeared in the pits, with a stall (Castroneves), lost wheel (Dixon, conveniently delivered to Franchitti’s pit box), departure with the fuel hose attached (Power), and crash on the ‘out’ lap (Briscoe). Game. Set. Match. Thus, Dario became the 17th two-time Indy champion and Chip Ganassi became the first team owner to win the Daytona 500 and Indy 500 in the same season. Yep, not even The Captain (Roger Penske) has accomplished that feat. Dario dominated, but hands-down the MVP – and crowd favorite of the day – was Tony Kanaan. Starting DFL in the field – having had a qualifying-weekend-from-hell and switched from his qualified backup car to a repaired primary – TK elicited cheer after cheer from the crowd as he rapidly scythed through the back half of the field in the opening laps – passing eight cars alone (if I counted correctly) on just his opening lap. Near the end of the race, Kanaan was the last real remaining threat to Franchitti’s dominance, but he likely used too much fuel in chasing down the leader, and was forced to pit on Lap 196 to end his challenge. That left Dario almost four seconds ahead of Dan Wheldon, with the Panther driver en-route to a second consecutive runner-up finish at the Speedway. Dan appeared to be closing significantly on Franchitti in the final laps, but in this case appearances only served to deceive, as both cars were, in reality, very low on fuel, and Dario was driving just fast enough to ensure a margin over the ’05 race winner. Alex Lloyd and the Dale Coyne crew did a wonderful job to finish fourth – the team’s best result at Indy. Replacing the departed (and much-missed earlier in the season) Bill Pappas with Mitch Davis as a combined engineer/team manager has once again turned DCR into a potential Mighty Mouse effort. It paid off on Race Day. And props to Andretti Autosport. For all their struggles with all five entries in qualifying, they moved all of their cars forward in the race. At various times, all but John Andretti [out relatively early after a suspension failure following contact] ran in the lead pack. Potential giant-killer FAZZT Racing was a bit of a fizzle on race day, another team caught out by the hot temps, Alex Tagliani struggled at the start of each stint, while Indy-only teammate Bruno Junqueira lost it exiting Turn Two early and was the second car out of the race. 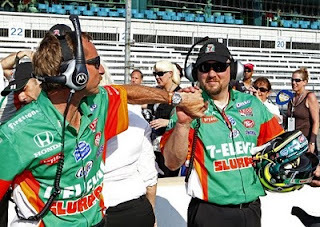 In the aftermath of the race and certain “commercial” issues that arose, team co-owner Jim Freudenberg departed, with veteran Team Manager Rob Edwards taking on commercial duties as well. There’s a lot of potential on this team, so a lot of us hope they find the sponsorship needed to join the big boys. Finally, there was the BIG CRASH on Lap 199 that ended the race under caution. Mike Conway was actually pretty lucky to get out of that one with “just” a fractured back and compound fracture of his left leg. It could have been much, much worse, and he’s already out of the hospital and recovering at home. He’ll be on the sidelines for most, if not all, of the rest of this season and late word has Graham Rahal taking over the #24 car from Iowa onward. It wasn’t a classic Indy 500, but it was an interesting one, and Dario was a most deserving winner. Meanwhile, for the rest of us, it was on to Texas. No rest for the wicked…. It’s been a little while since we’ve done one of these, but 17 days at Indy was jammed with action, so let’s get right to it. Walking through the garage area for the first (of what would be many, many) times, you noticed right away that Luzco Dragon Racing/De Ferran Motorsports is now simply de Ferran Dragon Racing – not exactly as short and to the point as “Team Penske Jr.”, but definitely less of a mouthful. The new team logos look cool, too. But apart from the new team name and new logo, nothing else in the management structure changes. 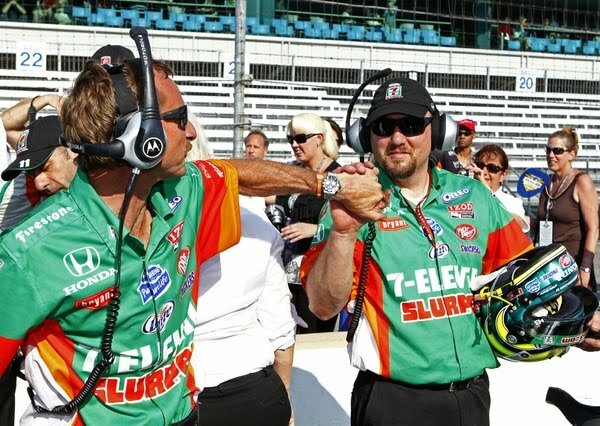 Gil de Ferran runs the team day-to-day with support from his California-based partners Steve Luczo and Jay Penske. One other team-name change, however, DOES indicate a significant shuffle at the top, as Newman Haas Lanigan Racing has once again become Newman Haas Racing. Mike Lanigan is out of the management picture for the Chicago-based team, and what that means for the long-term future of the operation is anyone’s guess. Paul Newman passed away nearly two years ago now, and co-ower Carl Haas is in poor health, leaving his wife Bernice (Bernie) running things. Hopefully, some new blood will be brought in soon to secure the future of what was once one of the very top teams in the sport. A late, but positive, addition to this year’s “500” field was the return of Rahal Letterman Racing with an entry for Graham Rahal. 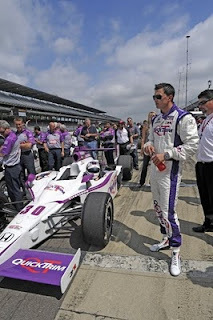 Another returnee to Indy after an absence of several years was the still-very-popular Roberto Guerrero, looking almost unchanged from his driving days and hanging out in the Bryan Herta Autosport garage to coach fellow Colombian and “500” rookie Sebastian Saavedra. Among the many welcome changes to the Indy schedule for 2010, both veterans and rookies (instead of just rookies) were on-track for Opening Day, which resulted in the best crowd I’ve seen on the first day of practice in several years. Also, there were no “down” days this year. In previous years, we had seven or so days of practice spread out over two weeks time, with days (usually Mondays and Tuesdays) of no on-track activity. But this year, we had seven consecutive days of practice (well, six actually, following Monday’s rainout), PLENTY of time for everybody to get their acts together. Although, of course, not everyone did…..
For me, one of the highlights of Opening Day was watching Andretti Autosport’s Tony Kanaan jump in and out of all five team cars in one day, in theory to establish a baseline setup for all of the team’s entries. That just might be a Speedway record for most cars driven by one person in a single day! As the week of practice progressed under cooler-than-normal conditions, a couple things became apparent: 1) Team Penske was going to be tough to beat for the pole – and had a good chance of locking up the entire front row; and 2) Andretti Autosport was struggling. We ended up with 38 drivers turning laps at the old Brickyard this year, including late addition Bruno Junqueira and ultra-late addition Jaques Lazier, so we had real bumping and a fair bit of drama on both qualifying days. And we had, by the standards of the times, great crowds for both days of qualifying, as well. The biggest change from practice to qualifying was the increasing temperatures. While big guns Penske, Ganassi and the impressive, small FAZZT operation coped well with the increasing heat, two other expected front-runners – Andretti and KV Racing – had already-tough weekends turn far, far worse when it counted. In KV’s case, it was due to crashes, crashes, still more crashes, and one VERY unexpected DNQ. E.J. Viso and Takuma Sato each crashed; Paul Tracy brushed the Turn 4 wall once; Mario Moraes crashed TWICE; and – incredibly – PT was unable to make the show. Andretti came into qualifying at the very bottom of the sine curve that had characterized its week – and then it got worse. Tony Kanaan inexplicably had two nearly identical crashes on Saturday AND Sunday, coming within a gnat’s eyelash of joining Tracy on the sidelin es. Danica Patrick had a very disappointing qualifying run and then earned a chorus of boos from the crowd when she slagged off her team over the track public address system. Marco and John Andretti and Ryan Hunter-Reay had quieter, but no less frustrating weekends, as all three qualified deep in the field. But drama is what makes Indy unique, and the qualifying weekend had it in spades, so I call it a success. Helio Castroneves’ pole run during the first-ever “Top 9” shootout was jaw-dropping fast, as were the repeated attempts by Will Power and Dario Franchitti to unseat him. It also was great to the see the FAZZT team, new this season, as a legitimate front-row contender with Alex Tagliani, and post the fastest Bump Day time with Junqueira. 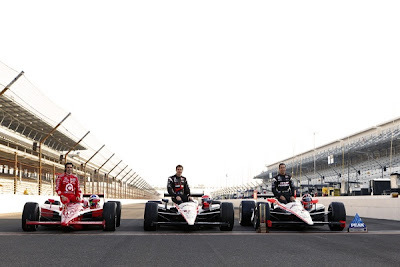 RLR and Panther were other teams to exceed expectations in qualifying, with Rahal and Ed Carpenter both making the “Fast Nine”. At the other end of the spectum, it was nail-biting time watching truly talented racers like Kanaan and Sato barely scrape into the show. And only at Indy can one driver (Saavedra) find out he has made the field while lying on his back at Methodist Hospital (the result of a crash earlier that day). 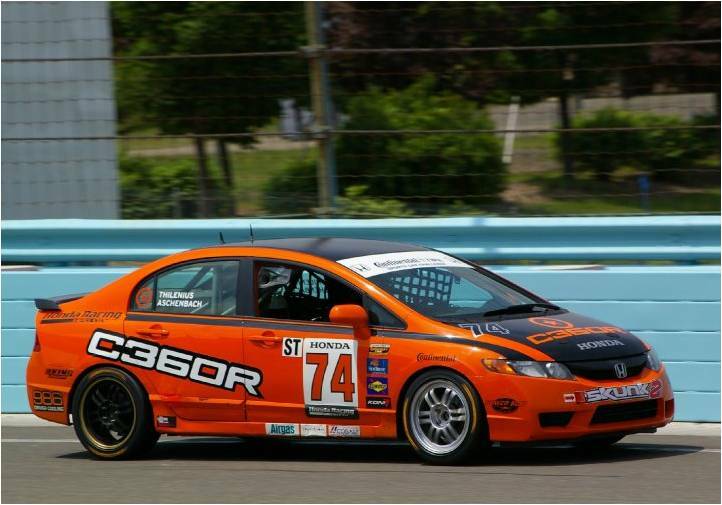 Compass360 Racing (C360R) took two of the three podium positions at the Continental Tire Sports Car Challenge event at Lime Rock Park this past weekend, marking a record-breaking string of five consecutive top-three finishes for a single team. Lawson Aschenbach and David Thilenius, co-driving the team's #74, were second, with Ryan Eversley and Zach Lutz in third. "The Compass360 crew gave us a great car today," remarked Aschenbach. "Our Honda was hooked up for the whole race, and I think we could have taken the win if not for that caution late in the race." Indeed, the 74 and 75 cars ran nose-to-tail for the latter half of the race, after their starting drivers made up for mid-pack qualifying efforts during their stints. The team's star story in qualifying was 18-year-old rookie Alex Kirby, who put the #77 Honda he shares with Greg Liefooghe first of the C360R cars in seventh position. Lutz was ninth, with Thilenius 12th, and John Kuitwaard in the #76 in 25th. The race started on a damp track after light showers coated the circuit with rain just prior to the start, which made for challenging conditions for the first drivers. Kirby held his own with considerable aplomb, while Lutz, Thilenius and Kuitwaard made their way forward despite the challenge of finding good passing opportunities on the tight, twisty Lime Rock, Connecticut circuit. A timely caution period allowed the team to execute some of the best pit stops of the race, netting the 74 and 75 cars first and second position on the road. the #76 car, now with Jesse Combs at the wheel, was also well-positioned. Unfortunately, as mis-cue on the radio meant Kirby came in a lap later than the other C360R cars, which put co-driver Liefooghe close to the back of the pack when the green flag fell. Up front, Aschenbach and Eversley battled for the lead while their main championship contender, Seth Thomas in the #81 BMW, made his way through the pack and eventually up to the front where he joined Andy Lally's Kia and Josh Hurley's VW to form the top five. While Liefooghe battle through traffic, Combs was battling traffic behind, and unfortunately was tagged by an overly optimistic RX-8 trying to pass on the grass at the end of No Name Straight, which pitched him into the Mini of VJ Mirzayan, ending both of their days on the spot. Ironically, the RX-8 expired just a few laps later. 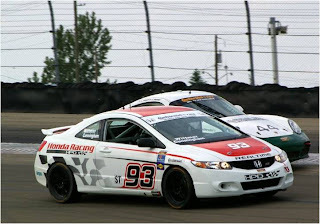 It ended what was sure to be a top-ten result for Combs and Kuitwaard, who won the race in 2009 in the same Compass360 Honda. Thanks to traffic, Aschenbach had a small lead over Eversley, who had a similar lead over Thomas, and it was looking good for a Compass360 one-two. Alas, a late-race caution came out and bunched up the field. On the restart, Thomas was able to take advantage of the BMW's superior brakes and passed the #75, and then the #74 in the closing stages of the race. "We gave it all we had," remarked Aschenbach, "but it wasn't to be today. The BMW's brakes proved to be stronger than we had today, and it was amazing to see Seth bring that car up from back in the pack." 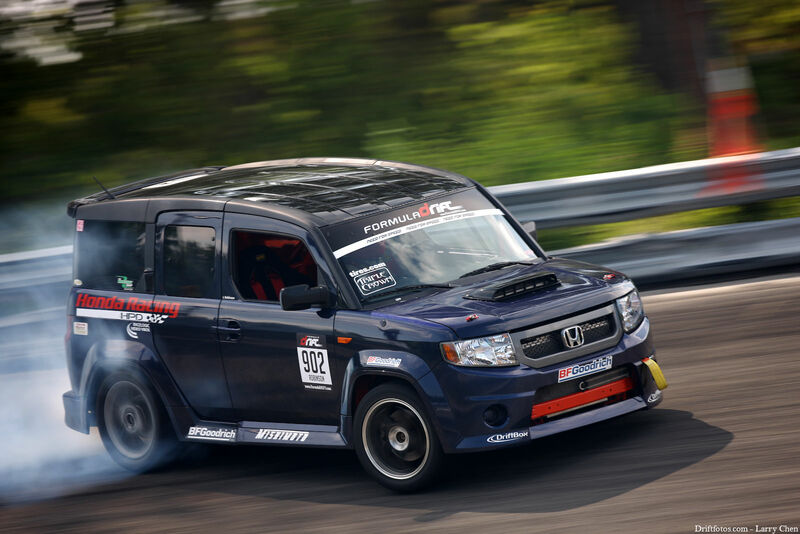 Added Eversley, "the guys at Skunk2 give us great power out of these high-revving Honda powerplants, and it's great to take two podium spots here at Lime Rock." Liefooghe, meanwhile, brought the #77 up to 12th position, gathering valuable championship points for he and co-driver Kirby. The BMW win narrows the #74's lead in the Driver's and Team's Championship to just three points (155-152), while Compass360's efforts so far have Honda well in front of the Manufacturer Championship 164-153. The teams in the Continental Tire Sports Car Challenge have only a few days to repair and refurbish their cars before they take to the track at the Continental Tire 150 at Watkins Glen this coming weekend, June 4th and 5th. 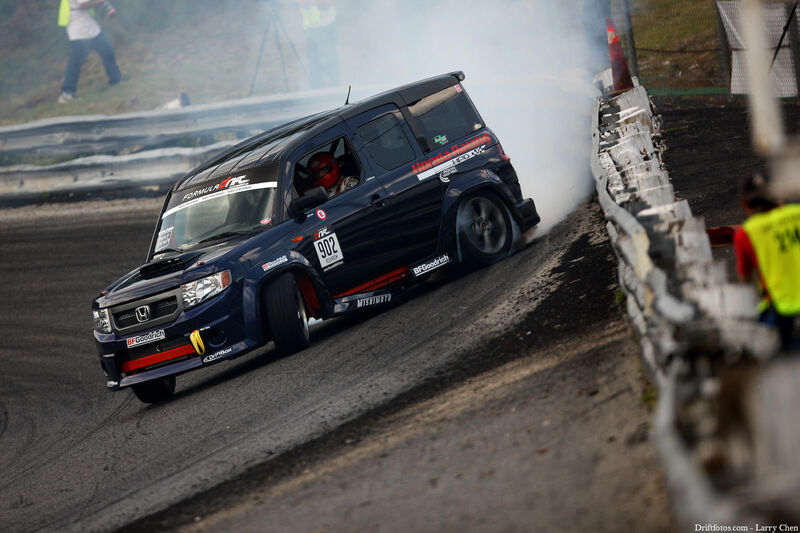 For details visit http://grand-am.com.